I was walking at the hallway when I bumped to Cory. She open up a conversation. Hi! Can I ask one quick question? Where can I find the MS Word templates? I would like to copy them. To find where the MS Word templates are stored, follow my lead. 1. 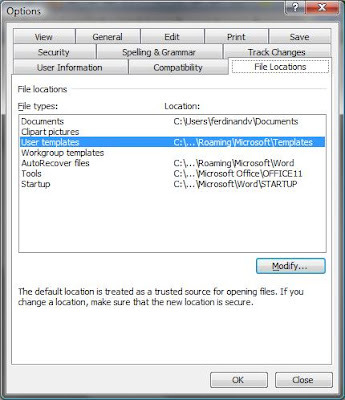 From the Tools menu choose options then Word displays the Options dialog box. 2. Click the File Locations tab then choose User Templates from the list. 3. If you want to locate it click Modify button. 1. Click the Office button and then click Word Options to display the Word Options dialog box. 2. Click Advanced at the left side of the dialog box. 3. Scroll to the bottom of the available options and click the File Locations button. 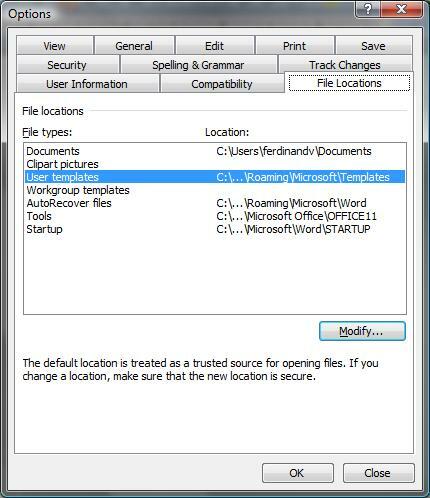 Word displays the File Locations dialog box. 4. From the list, choose User Templates. 5. If you want to locate it click Modify button.